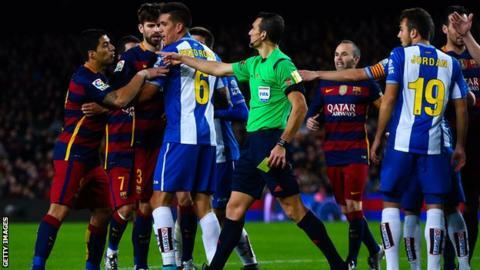 Luis Suarez has been banned for two matches for his part in a scuffle between Barcelona and Espanyol players after their Spanish Cup tie. The Uruguayan striker, 28, is alleged to have threatened opposition players in the tunnel following Wednesday's game, which Barcelona won 4-1. The ban applies to Copa del Rey matches only, including the return leg of the last-16 fixture on Wednesday. Barcelona, who are second in La Liga, are appealing against the decision. "Barcelona is expected to argue that the player, as he later stated, did not use the allegedly offensive words that were attributed to him in the referee's official notes following the match," the club said in a statement. During an ill-tempered contest at Nou Camp, the visitors had Hernan Perez and Pape Diop sent off, with the latter dismissed for an abusive comment aimed at former Liverpool striker Suarez. According to referee Juan Martinez Munuera's report, quoted by Catalan newspaper Sport, Suarez waited in the tunnel and shouted: "I'm waiting for you, come here! You're a waste of space." The two city rivals were involved in another tense derby, in which Barcelona star Neymar was the alleged target of racist chanting during a 0-0 draw at Espanyol's stadium, on 2 January.